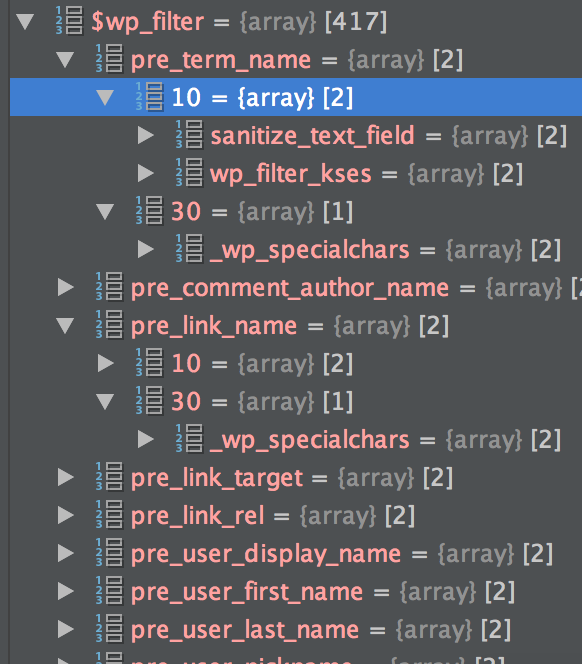 Global function add_filter is an integral part of WordPress core. Together with the function apply_filters, you can extend WordPress core, plugins and themes without touching a single line in them. Thanks to this, updates become straightforward — just copy and replace the old code with the new one. I’ll be explaining sections of WordPress core, line by line, in a series of articles, starting with this one. These topics will be of technical character. If you want to read about how to use this and that, I’ll include links to other resources at the end of each article. On the second line, global variables $wp_filter and $merged_filters are made available to the function by using the global keyword. Both of them are initialized as an array type at the top of the same file. On the 5th line, we can see that if it’s a string, the $idx will be that string (callback’s function name), nothing fancy. If it’s an object (line 8), we need to convert it into an array of ( <object instance>, '' ) type. The reason behind this is that function for executing custom functions (call_user_func) requires that format.